Meander quilting is a term that refers to free-motion quilting stitches that hold the layers of a quilt sandwich together in a random, meandering way. Although meander quilting can be done by either hand or machine, today's quilters use the technique most often when they quilt by machine. Meandering stitches usually do not usually overlap, but sometimes quilters create intentional curves or circles with stitches that do cross each other. Are Meander Quilting and Stipple Quilting the Same? Stipple quilting is another free motion quilting technique that is similar to meander quilting, but stipple quilting stitches are spaced closely together to create a more compact, flattened appearance than meander stitches. How Are Meandering Stitches Created? Machine sewn free motion quilting techniques are created with the machine's feed dogs in the down position and with either a darning presser foot or a specialty foot with a larger opening than is typically found in a darning foot. 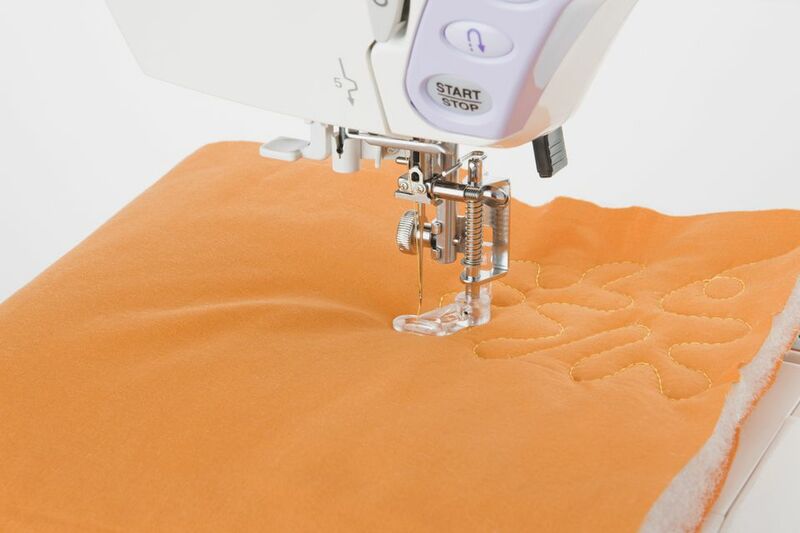 Most quilters like the better visibility provided by a specialty free motion presser foot. If your sewing machine manufacturer doesn't offer a special foot, try tone of the generic versions available from other companies. Check each company's list to make sure the foot will work with your machine. Both meander and stipple quilting stitches are a good choice when you need to fill large, open areas of a design. Meander quilting can be used as an overall quilting pattern that covers the entire quilt top. Stipple quilting isn't typically as effective when used across an entire quilt because it flattens the quilted areas, making it more suitable for parts of a quilt where you want to create a deeper design in some spots than in others. Don't hesitate to try stripping if you feel your quilt with benefit from the look. Meander and stipple quilting techniques are both a good choice for beginning machine quilters because they sometimes find that it's difficult to follow the marked lines of a specific design. Practice either technique with two pieces of scrap fabric. placing batting between them to create a practice quilt sandwich. Try doodling random lines on a piece of paper, drawing lines that don't intersect each other. That simple process helps give you a better feel for the look of meander and stipple stitches. Once you begin to sew, you'll find that actual practice with stitches offers a true feel for both methods. Take a closer look at the meander quilting stitches used in my pitcher and bowl quilt. This article contains an e-commerce link, and we may receive compensation in connection with your purchase of products via link on this page. Get DIY project ideas and easy-to-follow crafts to help you spruce up your space. The Spruce Crafts is part of the Dotdash publishing family.